Be careful out there this this weekend, folks. There’s a storm a comin’. 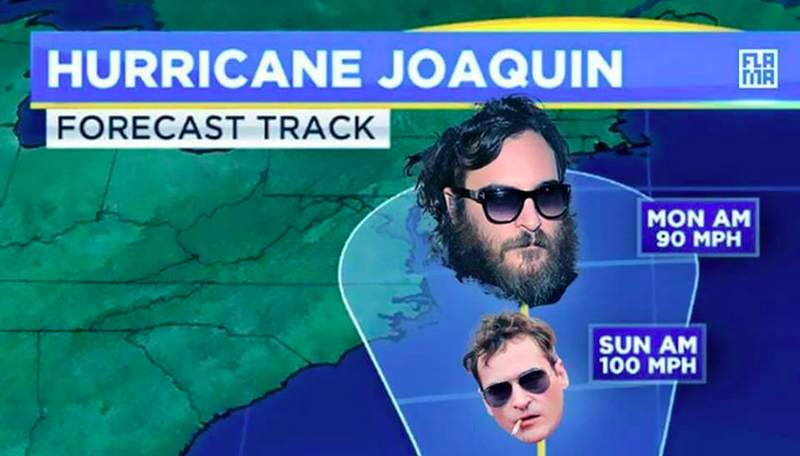 My favorite meme of the week has been Joaquin Phoenix’s face plastered across weather maps, as well as other mashups of the actor with the hurricane that shares his name. Where I am it’s looking like the storm is going to mostly pass us by, but it’s currently windy, rainy and cold in New York City—fall is here, and telling us not to go outside. What’s on your mind, Gizmodo? Do you feel like spending the weekend reading and Netflixing like me, or do you have plans to brave the outdoors? Also: Which Joaquin Phoenix movie that I’ve been meaning to watch should I see first—Her or The Master? And can we talk about how bad Walk the Line was?